What is the difference between a butterfly and a moth? My nine year old daughter went a bit crazy on the butterflies and moths this Summer. It was great to see so many of them and herself and her friend spent hours catching them, minding them in the insect observer they have, identifying which type they were and eventually setting them free. To my knowledge none of them were harmed in the process and along with plenty of fresh air she also got to learn a lot about nature! 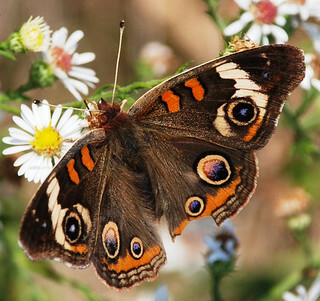 Moths and butterflies both belong to the order Lepidoptera (which means scaled wings). They both start their lives as caterpillars and then transform into winged insects that eat nectar in the adult phase of their life. There are however many general differences between butterflies and moths, although for each difference there is usually a moth or butterfly that is an exception to the rule! So here are some differences between butterflies and moths…. Most moths are active at night (nocturnal) while butterflies usually fly during the day (diurnal ). The antenna on butterflies tend to have a little ball at the end, these are referred to as clubbed, while the antenna of moths are usually plain or feathered. Butterflies fold their wings together behind their back when at rest while moths tend to place their wings down their backs. The forewing and hindwing of a moth are attached together by a filament called a frenulum. This allows the wings to move together in flight. Butterflies do not have frenulums. Both butterflies and moths undergo a complete metamorphosis (homometabolism) from egg to caterpillar, to chrysalis to adult. However the chrysalis of a moth is usually enclosed in a cocoon of silk while that of a butterfly is not. Butterflies tend to be more colourful than moths, although this is not always the case! 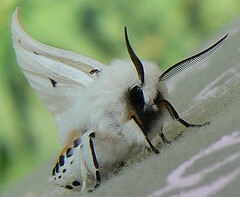 Moths tend to have hairy, plump bodies while most butterflies have more smooth, slim bodies. There are, as I mentioned, plenty of exceptions to all these rules…. the Madagascar sunset moth (Chrysiridia rhipheus) is a good example. The bright colours of this day flying moth are more akin to the colours we expect from a butterfly rather than a moth! As always, Mother Nature likes to keep us on our toes! If you have spotted any unusual butterflies or moths lately or have anything to add please leave your comment below! Your photo of the Monarch is actually a Queen butterfly. You can tell from the presence of defined white spots on the hindwing. Thank you for sharing some very helpful and useful information! This will certainly help a lot of people! Your photographs paint a pleasant picture of both species. Your distinction between the different placement of wings seen in butterflies vs. moths was an interesting one. Thanks for this. My son and I had this conversation on the school run this morning. I was telling him about your blog. He knew the bgall at the end of the anttennae bit and I knew the nocturnal one. Nice to find out a couple more. We’re going to put Gags to the test now the next time we see him. Yay so glad you both liked it. have to tell my daughter that her inspired blog got people talking ;0) I’m impressed with the details you already knew. Hope Gags is up to the test!